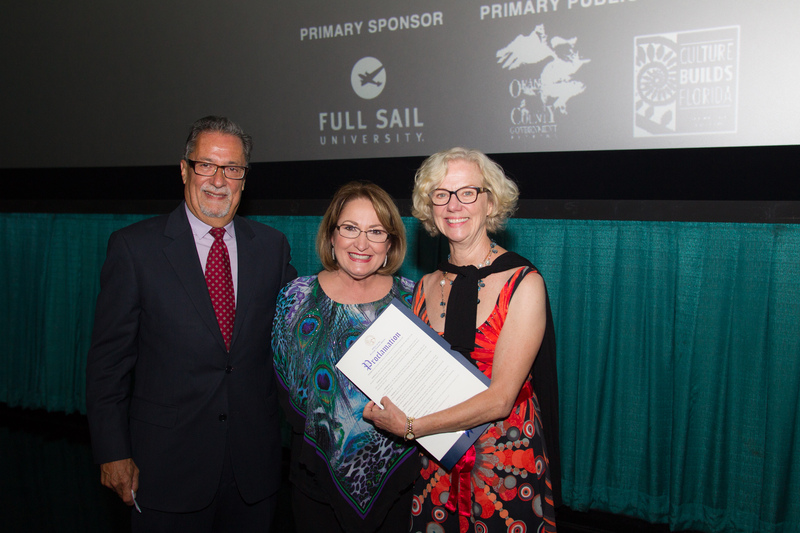 Mayor Jacobs presented a proclamation declaring the opening day, April 8, as Florida Film Festival Day in Orange County. During the proclamation, Mayor Jacobs highlighted the importance of the film festival and how far the festival has come in its many years of screening. The Florida Film Festival celebrates diverse filmmaking talent and screens films that represent 36 countries; with 33 percent of those films directed by females this year. The Festival is accredited by the Academy of Motion Picture Arts and Sciences in the categories of Live Action Short Film, Animated Short Film and Documentary Short Subject – making it one of only 19 festivals in the world to be accredited in all three categories. The Enzian Theater opened in 1985 has hosted the Florida Film Festival since 1992. The iconic theater won an award for the “Best Little Arthouse in America” from Indiewire, a news site for the independent film community. The Festival was named one of the “Coolest Film Festivals” by MovieMaker, a publication dedicated to the art and business of movie-making. The 10-day celebration will continue until April 17, and will be screening a record 181 films this year. Thirty-five of those films are directed by previous Florida Film Festival alumni. The Florida Film Festival is sponsored by Full Sail University, Orange County Government and the Florida Division of Cultural Affairs. For a list of films and full screening schedule, visit the Florida Film Festival website. To view photos from the opening night event, visit Mayor Jacobs’ Flickr album.